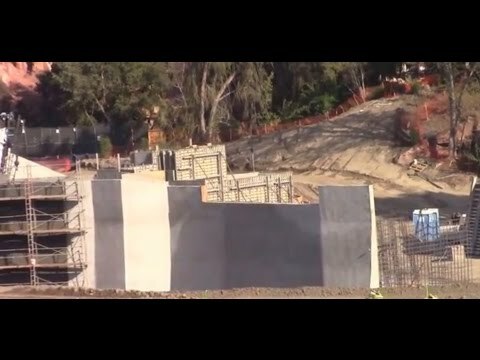 I mean they're adding more waterproofing to the top of the wall behind Fantasyland Theater look at this picture closely again...they will be backfilling higher. Ah, I see! You are correct, then. I really wonder what a dirt hill of that size will be used for in SWL. Dead Mice Tell No Tails! I'm guessing the DLRR's new path will be on this side of the very high wall providing a buffer for the Fantasyland Theater from train noise as it makes it final turn through the tunnel into the Toontown station. I found another great HD video of SWL construction from Sunday 8/28. A few things I noticed of interest but there are many more. •4:00min and 7:30min in: close up of the demo below the Hungry Bear for the new path to SWL and the start of the new route for the DLRR from behind the HB. •5:00min in: so many retaining walls going up we soon will not be able to see the new path of ROA. •8:21min in: excavation for show building and site in general. ​​•13:40min in: concrete in place on the top of the entrance to SWL where the DLRR will pass over. Actually, looking at the ariel views, I don't know if even that wall will be able to hide the FL Theater, though it may be possible with grading to the top of the wall and heavy tall landscaping. The train will probably maintain it's elevation with it's "back" facing the new pile supported wall that may be part of a tunnel around the back of the theater. 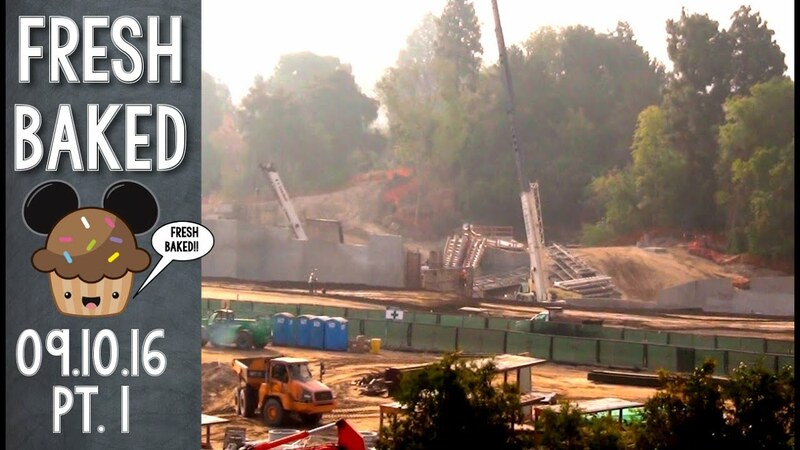 not sure if anyone had noticed but it looks like several trees along Disneyland drive next to the Star Wars construction site have been removed. now the only thing blocking the view into the construction site is a fence but it seems that by removing those trees the construction site pushed out closer to the street a bit. I wonder if when all said and done if new trees will be planted or if it will just be the fencing against the back of the rock wall. It may be because the backstage road in that area is so close to the fence that there is no room for trees. Another new video of SWL construction from Thursday 9/1/16. A few points I found of interest. 3:00 in: A good close up view of the entrance to SWL from the Big Thunder trail where DLRR will pass over. 6:30 to 8:30 in: Driving one of the steel I beams into the ground near where the Skyway Chalet used to be. 9:30 in: Show building excavation. 14:30 in: Path to SWL below the Hungry Bear. 15:14 in: Start of new route for DLRR from behind the HB. 16:15 in: Close up look at the show building excavation. The videos with no commentary are kinda' nicer than the ones with all of the chit-chat. They're also longer and cover more area. Maybe someone with heavy construction experience can explain the purpose of the bundles of cables that are protruding from the vertical beams in the excavated area. If I had to guess, I would say that they will be used as part of a high-tension slab, except that they're only protruding from some of the beams. They are tie-backs, used to prevent the wall from getting pushed over from the weight of the dirt behind it. I suspect that they might be digging this pit even deeper. They stopped at this level to put in a row of tie-back, and then would start digging deeper when that is complete. One thing I can say for this new project is that we are learning a lot about construction techniques. More video, showing a lot more walls going up. Right at the 8:00 point, we can see that large, arched wall consisting of the vertical 'H beams' and a lot of horizontal wood beams or planks. Those H beams have the same slanted holes in them that are used for tie-backs, so I wonder if we'll see tie-backs there, too, and what that wall will support. That wall is already retaining soil. If you remember, they drove all of those vertical I beams into a large mount dirt they'd built up during the initial excavation. They started placing pressure treated lumber between the I beams at the to of that mound and excavate down on the one side as they installed more planks downward from the top. You can see the other side of that area and how the soil is being retained near the end at about 15:40. Another thing I noticed at about 10:00. They've welded some horizontal I beams to support what will eventually support the floor at the eastern portion of show building excavation. So it doesn't appear as thought the'll be going any deeper in that area. They're moving at a rapid pace. I think those horizontal beams are there to hold the retaining wall back, not as the start of a floor. If you look closely at that area there are no tie backs in the vertical beams like there are in the large area. I am guessing that the area were the horizontal beams are is to small to get the equipment in that is needed to install the tie backs, so instead they have installed the vertical beams to stabilize the walls. Those are massive wide flange beams to just hold the wall back. The vertical "retaining" walls are termed that for a reason, they retain the soil behind them. Those vertical beams are driven quite deep. If they aren't going to excavate any deeper in that area than they have already then there isn't a need for tie backs in that area. We shall see, that's whats so much fun about this project tracker, we get to exchange ideas and speculate. Last edited by Hammer; 09-11-2016, 02:32 PM. Another video. The view isn't the best, due to a lot of haze, but it's obvious that the 'pool' is now considerably deeper. This video from Sunday 9-11-16 has some very interesting things from a different perspective. 6:45: A totally different view of the SWL construction site from much farther north on the parking structure. 8:20-8:55: They've removed the support forms from under the new entry tunnel as the concrete has now cured enough to do so. From this angle we can also see the closed gates on the path to FL. 10:50: The tunnel for the access road behind TT to the FL Theatre. 13:05: A close up look at the continuing show building excavation. Last edited by Hammer; 09-13-2016, 02:20 PM. Nice. It looks like the a lot of earth has been move away from the front of the big wall of girders and pressure treated lumber. (Henceforth, I shall call this 'the green wall', for brevity's sake.) Things are moving fast! What I wouldn't give for a good overhead view! The "pool" is obviously the sub basement for the major attraction in that area. If they have a lot of mechanical elements in the attraction (like elevators), they will need space and access. I would imagine that there are a lot of attraction facilities that have mechanical pits below them. You want to know "why that dirt is there?" (6:25). It's more than likely because they are building a berm upon which to plant heavy landscaping in order to hide the Fantasyland Theater. Dense landscaping can hide some large eyesores, as evidenced by the Jungle Cruise berm hiding the Indy building. All times are GMT-8. This page was generated at 10:47 PM.